The Australian Cattle Dog is a sturdy compact dog that is agile and swift. This breed has a slightly curved tail and straight front legs. Australian Cattle Dogs come in blue merle or red speckle. Blue merle is blue or blue-mottle with or without black, blue or tan markings on the head with tan. The Australian Cattle Dog's coarse waterproof coat is short and requires brushing only when necessary. 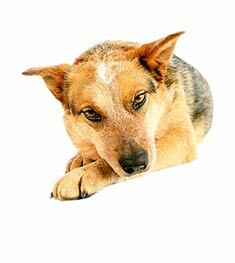 Independent and obedient, Australian Cattle Dogs are sometimes suspicious of people they don't know. Australian Cattle Dogs are loyal and tireless hardworkers who are devoted to protecting their owners, herd and property. Australian Cattle Dogs are prone to Prone to hip dysplasia, PRA, and deafness. The Australian Cattle Dog can be expected to live about 12-15 years. Australian Cattle Dogs are hardworking farm dogs and need to chase, heard and run. 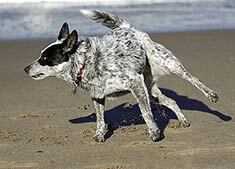 Australian Cattle Dogs require lots of exercise; otherwise they become unhappy and possibly destructive. Find Australian Cattle Dog Puppies with our Free Breeder search!